18in Doll Ballet Tutu - Fits American Girl Doll®. Each dress is handmade in the USA from quality lycra or glitter velvet and tulle. Great gift for any girl! Very limited quantities! 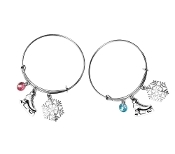 ChloeNoel Figure Skate Charm Bracelet made with either blue or pink crystal skate charm and snowflake charm. Great gift for your skater! ChloeNoel figure Skate bracelet made with either blue or pink skate and skate lettering with crystals. Lobster claw clasp. Great gift for your skater! GloveStix & ShoeStix Insert Refills. Fits GloveStix and ShoeStix Products. ShoeStix are sold separately...these are refills only. The fresh scented insert should be replaced every 90-120 days for optimum performance. Mirrored after the Nfinity a shoe case, this hard exterior Makeup case protects while the interior zippered compartments organize your jewelry, makeup, and toiletries, and the eight-piece brush holder promises to protect the integrity of your set. Great for cheerleaders, dancers & skaters! Rhinestone Hair Coils. 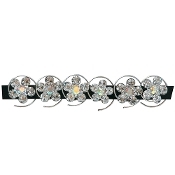 Flowers consisting of both Crystal and Crystal AB rhinestones. Coils measure approximately 1/2" wide. Each set has 6 coils. 6 per package. 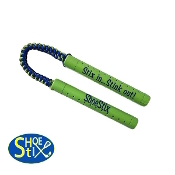 ShoeStix are the solution to your stink. ShoeStix will quickly absorb moisture, eliminate the odor, and inhibit the growth of odor-causing bacteria. ShoeStix do not mask the smell… they work hard to neutralize it! 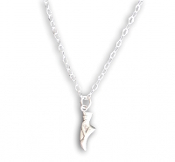 ShoeStix are designed to easily... Sterling Silver Ballerina Shoe Necklace. Chain, pendant and clasp all made from fine sterling silver. Chain is 18" long with lobster clasp. Great gift for your dancer! 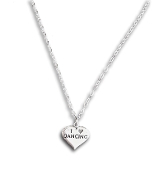 Sterling Silver I Love Dancing Heart Necklace. Chain, pendant and clasp all made from fine sterling silver. Chain is 18" long with lobster clasp. Great gift for your dancer! 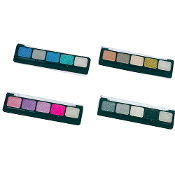 Eye shadow features a 5-color palette kit that includes three shadows, two glitter gels and an applicator brush. In 4 terrific color hues to achieve a lavish look on stage. 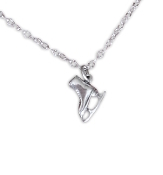 Figure Skate necklace made with either blue or pink crystals. Lobster claw clasp. 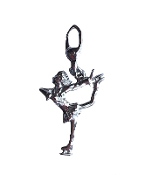 Sterling Silver Figure Skater Charm with lobster claw clasp. Charm measures 3/4" long x 1/2" wide. Not quite sure what to buy for your special skater? Try a gift certificate! Gift certificates can be used to purchase any item. Ice Fire 18" Doll Ice Skating Outfit . 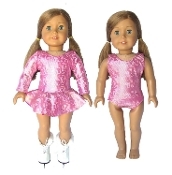 These cute practice ice skating clothes will fit 18" doll, American Girl Doll. Set includes jacket and pants. These 18in Doll Figure Skating Dresses are just adorable! Fits American Girl Doll® Each dress is handmade in the USA from quality lycra or glitter velvet. Great Birthday or Christmas present! Very limited quantities. Builds perfectly neat buns in 3 easy steps. 1 per package. Choose from Adult or Youth sizes. Pro-Tech Skin Cream is serious protection for dry, sensitive, damaged, and irritated Skin. Creates a natural barrier to retain your body's moisture and keep skin from drying out. Want to make your pencils look extra sharp? This case-in-point holds an assortment of writing elements (and other gadgets) and comes in a rainbow of colors. Bunheads Pearlz Hair Net. Resin pearl adornments. Keep hair looking neat and tidy with this hair accessory. Choose the color that best matches your hair. 2 per package. Short Lycra White Gloves. One pair. The perfect accessory for all your costume needs! Available in Black or White. Adult Size White only. 18in Doll Ice Skating Dress - Fits American Girl Doll®. These 18in Doll Figure Skating Dresses are just adorable! Fits American Girl Doll® Each dress is handmade in the USA from quality lycra or glitter velvet. Great Birthday or Christmas present! Very limited quantities. These 18in Doll Figure Skating Dresses are just adorable! Fits American Girl Doll® Each dress is handmade in the USA from quality lycra or glitter velvet. Great gift for any girl! Very limited quantities.